For as long as we can remember, rumours have been circulating in our family that our surname – ‘Jopson’ – may, in fact, be Swedish. 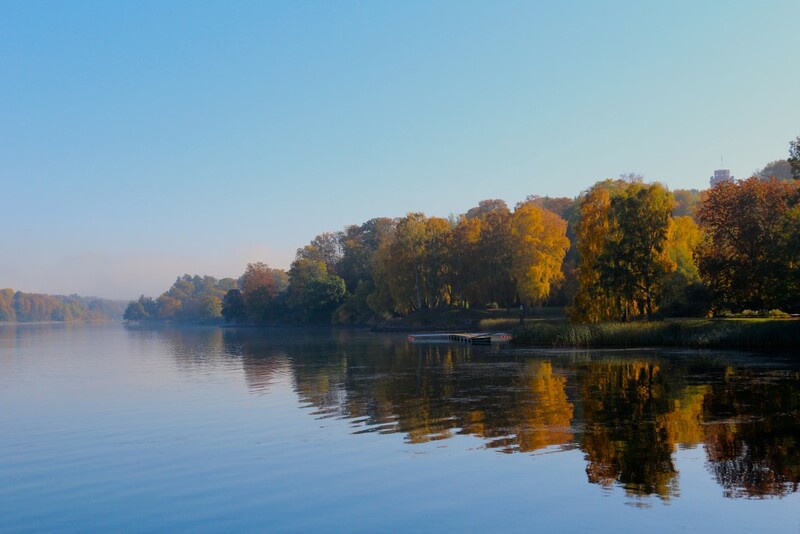 It’s a rumour that we’ve clung to; daydreaming that our family, now residing in the cosmopolitan epicentre of Milton Keynes, may have originated from a country of pristine pine forests, genetically blessed locals and colourful summer cabins. Yet aside from its beauty, Sweden is also a country that is, quite simply, cool. From its cities bursting with ahead of the curve micro-breweries, eateries and Acne stores, to its now globalised style of interior design (IKEA), it’s a country whose unique style of Scandi-cool is imitated the world over. Yet, this ‘coolness’ isn’t new. Unlike the self-conscious neighbourhoods of London’s Shoreditch or Brooklyn’s Willamsburg, Sweden has always fostered the creativity, individuality and (apparently) unpretentious lifestyle that is coveted in fashionable neighbourhoods across the world. Sweden, quite simply, is the original hipster. We all know a hipster. Full (yet carefully maintained) beards; checked shirts; tortoiseshell glasses; and a rejection of the mainstream in preference for more ‘genuine’ pursuits such as baking, knitting or using a Nokia 3210; hipsters are an international breed of folk. Yet, head out into Sweden’s countryside and you’ll find that this modern day phenomenon isn’t so new at all. In fact, it’s been around for years. 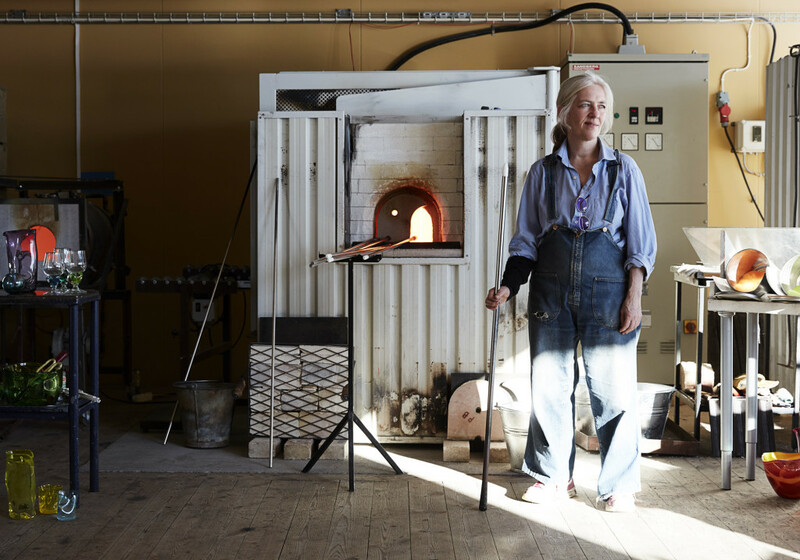 To celebrate this, Visit Sweden have run a fantastic and beautifully photographed series on The Original Hipsters of Sweden, visiting glassblowers, textile printers and bakers. Below are their stories; stories of individuals whose everyday lives would turn most urban, anxious hipsters green with envy. The Swedish history of crispbread dates back a thousand years. Crispbread bakers used to be a travelling people, walking the countryside after the harvest, baking crispbread from rye flour in the farms’ own bakeries. 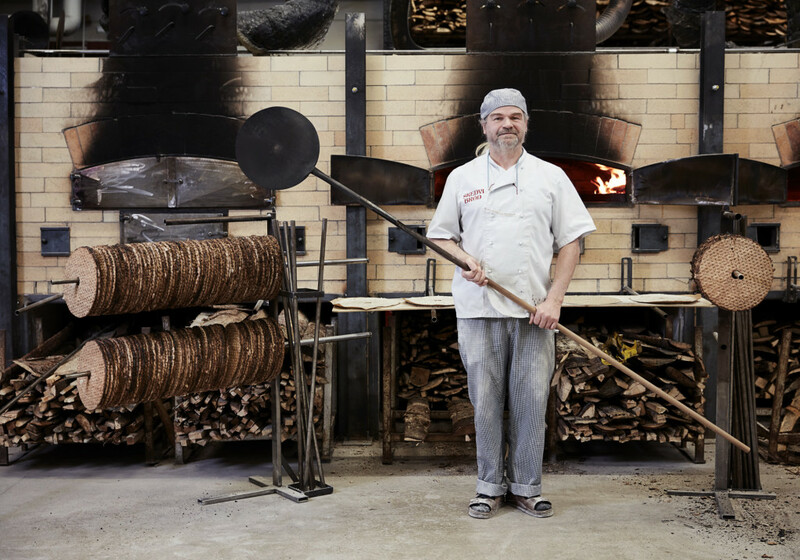 Joel Lindblad doesn’t need to travel to bake his bread. Day in and day out, this bearded man stands in his flour covered Birkenstock sandals, baking his bread in Stora Skedvi in the southern part of Dalarna province. He has stood on that spot since 1979, the year he started baking. It took him a few years to learn the craft and get to know the oven, to understand its heat. The ovens here in Skedvi knäckebrödsbageri are wood-fired. Pieces of bone-dry fir and pinewood are being shoved in continuously by the bakers. Joel and the other bakers perform a perfectly orchestrated dance in front of the ovens, a blend of ballet and boxing. They swing their peels (long flat baking spades for deep hot ovens) with deliberate, perfect movements. They fetch unbaked crispbread cakes and put them in the ovens. They start at the far right end, next to the wood and fire. After half a minute the cakes are moved to the far left, the coolest area of the oven. Then they are finished off in the middle. Baking a bread takes between 60 and 90 seconds, depending on oven temperature. 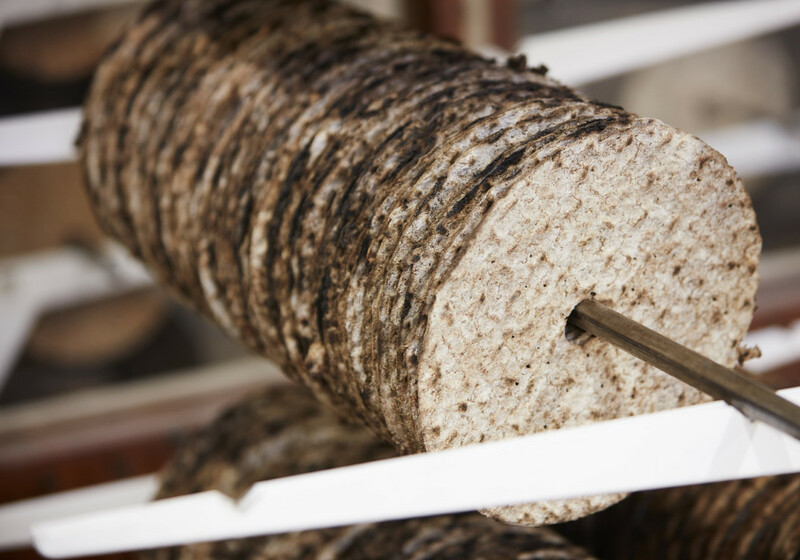 Today, Skedvi is the only crispbread on the market that is baked in wood-fired ovens. The crispbread industry has become centralised and streamlined with the vast majority of all crispbread coming out of a few large industrial bakeries. But in the same spirit that gave us micro-breweries, crispbread enthusiasts have grown tired of the industrial product and are now starting their own bakeries. In Skedvi’s case they are fuelled by equal measures of conifer wood and strong determination. Food is not only an important part of any hipster lifestyle (street food, pop up restaurants and falafel bars especially), but an inherent part of experiencing authentic Sweden. Thankfully, for any budding ‘original’ hipsters out there, you can try baking your own organic Swedish crispread if you visit Skåne in Sweden, visiting the wonderful eco restaurant and farm shop, Ängavallen. If you fancy immersing yourself deeper into the foodie scene, then definitely try the Slice of Swedish Hospitality experience. This service allows visitors to Sweden to eat with locals: enjoying amazing food, drink and company. All you need to do is pick your host family and turn up in time for dinner! What could be better? This is the perfect way to try local, seasonal delicacies, whilst getting to know more about everyday life in Sweden first-hand from locals. Currently, most host families can be found in the South of Sweden in Skåne, but more opportunities to enjoy dinner with local families are now available in Stockholm. Inside a schoolbuilding outside Gnesta, Södermanland, Ebba von Wachenfeldt has been blowing glass for over twelve years. The oldest building, dating from the early 20th century, houses her exhibition area. The newer, 1960’s school building is her workplace and shop. Generous windows allow sunlight to flow freely through her rooms. There is ample space for a warehouse, storage and a studio. But what made Ebba fall for the building at first was something rather unexpected. ‘All the electricity! There is soo much here – 200 amps! We only need 60, and even that is hard to come by in ordinary houses’. Ebba von Wachenfeldt puts on a pair of lilac sunglasses that could have been worn by John Lennon towards the end of his career. They block some of the radiant heat from the furnaces. Her workshop is glowing hot. The hottest furnace is 1,100 degrees Celsius. Ebba picks up a ‘gather’, the first glob of molten glass at the end of the blowpipe. She starts spinning the pipe. Hedda, her eight year-old, brown and white Springer Spaniel, moves around her feet. ‘She came too close to the furnace once and burnt her whiskers. It took her five years to work up the courage to enter the workshop again’. 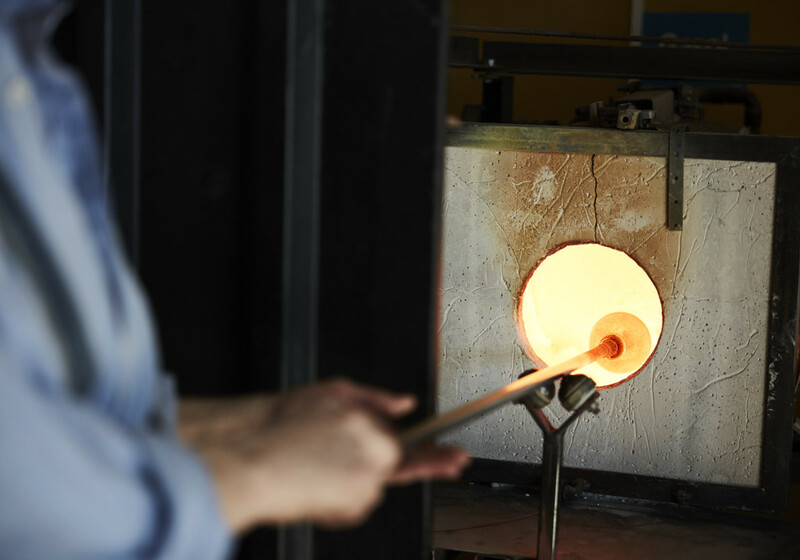 If you want to experience some traditional glassblowing of your own, then it’s worth visiting The Kingdom of Crystal (Glasriket) in the region of Småland. Here they’ve been crafting handblown glass since 1743 and visitors are even allowed to stand next to the furnaces to watch the artists in action! 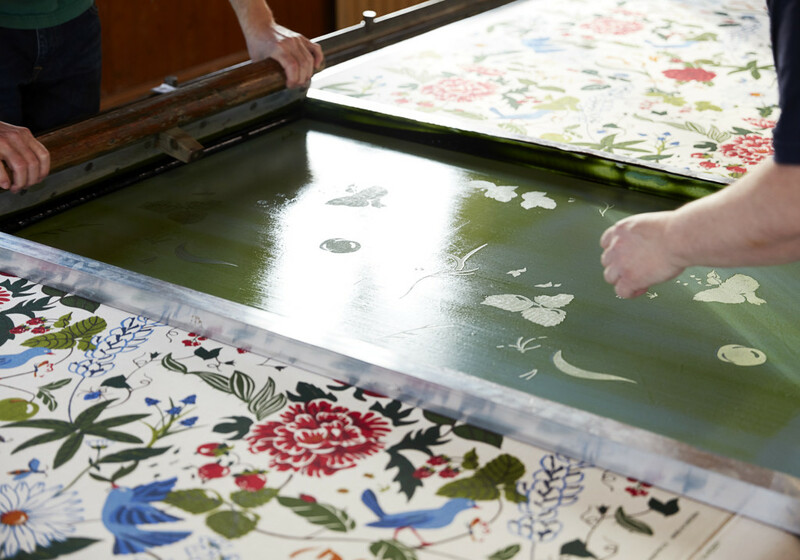 While other textile print workshops have turned to more industrial manufacturing, more digital processing, Jobs Handtryck, run by Tord Agge and his wife Åsa, remains essentially where it started in 1944. They take on a new pattern about once a decade; developing the colours and building the templates is expensive. ‘We can’t follow trends. We are slow and must be so. We do know which trends are developing, but there is simply not the time to follow them’, Åsa explains. 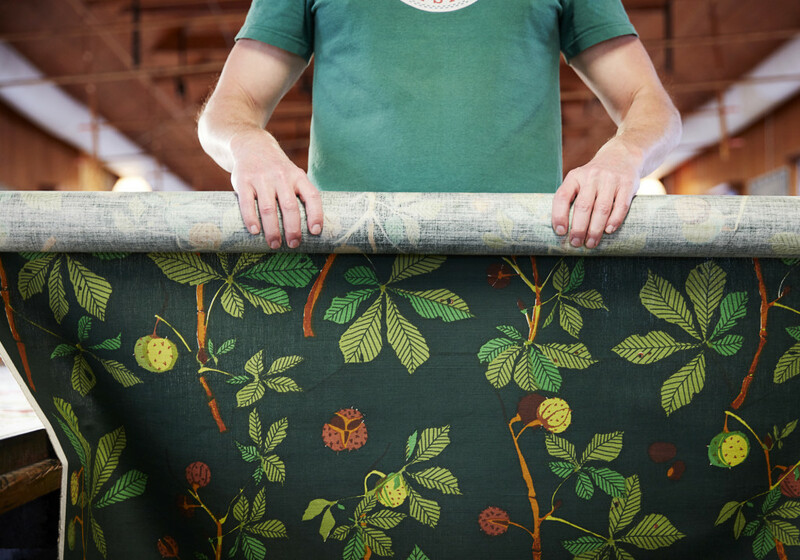 Instead of anxiously trying to catch up with the latest trends – say, pineapples and monstera leaf patterns – Åsa and mixing master, Jesper Jobs, make sure their fabrics and patterns maintain a timeless quality. Interestingly, most of Jobs’ patterns would not seem out of place on something like the hip It’s Nice That’s Instagram account: presently they are in par with modern graphic design. Up in the print shop, Tord and Jesper walk along opposite sides of the printing tables. They pull a wide scraper back and forth across the template. Right in the middle, the scraper changes hands seamlessly from Jesper to Tord, Tord to Jesper. They work in silence. Watching the paint bubble and sink into the fabric is contemplative. The two printers work in complete, quiet concentration. In one day they can print twelve colors on 60 meters of fabric. For Sweden, being ‘cool’ is something that goes far beyond vintage shops, skinny jeans and bars filled with board games. It’s something that has come naturally and organically to this country: felt throughout its independent textile shops, artisan bakeries and vibrant arts and crafts. It’s Joel the baker’s flour covered Birkenstocks and Ebba’s lilac sunglasses. Åsa’s prints and Tord’s attention to detail and quality. There’s no need for flannel shirts or brogues here: these are the original Hipsters and Sweden is their home. Hipsters of the world, take note. "June Competition Time: Forbes and Lewis"
"A guide to Central and Eastern Tuscany"